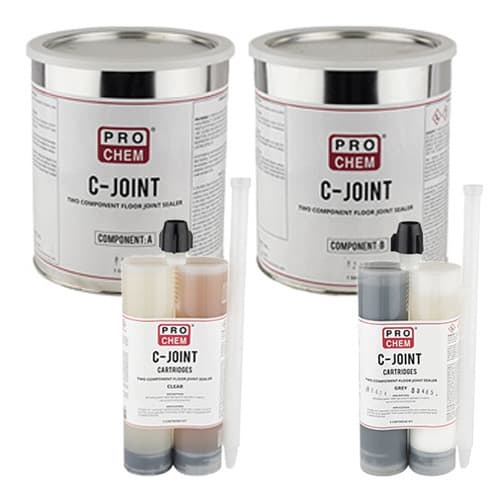 C-JOINT | Pro Chem, Inc.
C-JOINT is a two-component, 100% solids, heavy-duty epoxy joint filler for industrial floors. It may be used for repairing spalls, cracks and damaged joints. It can also be used as a joint filler for industrial concrete floors subjected to hard-wheeled vehicles such as forklifts. Area must be clean and dry. Saw-cuts should be blown clean and dry to remove dust and debris. Remove curing and sealing compounds. Stir both A & B components separately before mixing together. Mix thoroughly with a heavy-duty, low speed drill fitted with a mixing paddle. Mix until a uniform gray color appears and no streaks are evident. Apply with bulk caulking gun or pour from can. Fill joints flush to the top or slightly higher than the surrounding surface. To prevent C-JOINT from running through shrinkage cracks at bottom of joint, apply a maximum of ¼” of fine sand. A second pass prior to curing may be necessary due to the fact that all pour grade materials will “dish” or become concave. 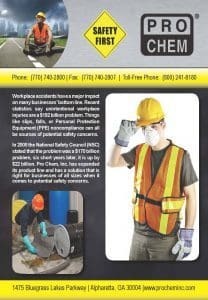 Remove all tape and clean spills and tools immediately with a suitable solvent such as xylene or lacquer thinner. Initial Cure Time: 6-8 hours. Limitations: Do not apply when temperature is below 50°F. Do not use on true expansion joints, exterior joints, tooled joints or joints subject to chemical exposure. Do not install in concrete less than 28 days old. Best results are obtained when applied at least 3-6 months after construction. Do not use compressible backer rod. 2 Gallon Kit: *Mix Part A and B together in a separate, larger container. Dual Cartridges: If entire contents are not used in one application there will need to be a new mixing nozzle each time.